Most naval enthusiasts are familiar with the groundbreaking 19th century warship innovations that have influenced warship design down to the present day. The revolving turret, the iron and later steel hull, armor plate, the mine and the self-propelled torpedo and steam propulsion are all familiar signposts on the way to the fleets of the 20th and 21st century. One such innovation (or retrograde feature) in warship design did not survive to see duty beyond the first four years of the 20th century despite being a prominent feature on every major capital warship from the 1860’s to 1904. The Ram bow was once considered more lethal in ship-killing than either the gun or the nascent torpedo and mine. Thanks to its accidental success in the American Civil War and in the 1866 battle of Lissa between Austrian and Italian fleets, the ram acquired a fearsome reputation not seen since ancient times. Despite it supposed potential, the ram claimed many more victims in peacetime accident than it did in war. The British, French, and even the American navies built expensive rams that wasted valuable resources and never saw combat. Incidents such as the sinking of the USS Cumberland by the CSS Virginia in 1862 and the spectacular loss of the Italian flagship Re D’ Italia when rammed by it’s Austrian opposite number Ferdinand Max in the 1866 Austro-Prussian (and Italian) war convinced many ship designers that the ram was now a preeminent weapon in war at sea. In the words of the late British naval designer D. K. Brown, the ram was the key piece of naval technology to overcome the new iron hull and armor in place of naval guns which often failed in this endeavor. The majority of capital ships after 1866 started to go to sea with rams, but their victims were nearly always friends and not the foes imagined. The British armored frigate HMS Iron Duke sank her sister ship HMS Vanguard in August 1875 as both ships blundered about in heavy fog. 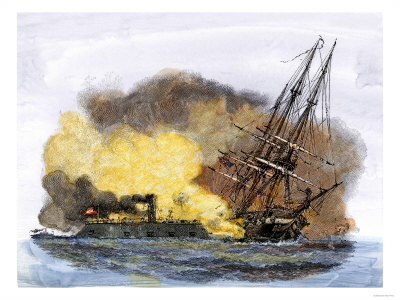 In May 1878, the German armored frigate SMS Konig Wilhelm rammed and sank the armored turret ship SMS Grosser Kurfurst in a maneuvering accident in clear weather. Finally, in a spectacular and terrible incident in 1893, the battleship HMS Camperdown rammed and sank the flagship of the British Mediterranean fleet HMS Victoria, who took 358 men and the commanding Admiral of the fleet Sir George Tryon to the bottom off Beirut, Lebanon. While most rams were mere add-ons to capital ships, some were purpose built with no other combat function. HMS Polyphemus was built in the late 1870’s for over 170,000 pounds sterling. Although she was the first British warship to have an electric light and be painted a gr ay color for camouflage, Polyphemus was an expensive experiment soon overtaken by the technology of rapid fire guns. While the Polyphemus also had torpedoes as a weapon, the USS Katahdin,commissioned in 1893 at a cost of over $900,000 was a pure ram with only light weapons. 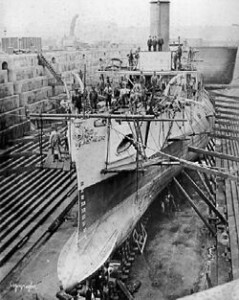 Painted green to camouflage herself in coastal waters, Katahdin was a harbor defense weapon against invading enemy fleets seeking to shell U.S. cities. 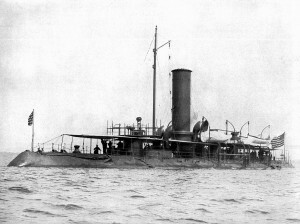 Although briefly in commission for the Spanish American war, Katahdin saw no combat and little active service before being sunk as a target off the mouth of the Rappahannock river in 1909. The ram is another example of a so-called “transformative” weapon that in reality was a retrograde feature in warship construction. The steady march of conventional weapon technology in the form of accurate, long range, director-fired guns and faster, longer-range torpedoes eventually overcame any potential held by the ram. Most importantly, the ram bow was a tactical misconception that was rarely tested in peace or evaluated in wartime use, but remained an integral and expensive element of warship design for nearly 50 years. In an ironic twist of fate, the first modern battleship without a ram bow, the famous HMS Dreadnought, actually rammed and sank a German U boat in March 1915. It was an even more bizarre event in that the commander of the rammed submarine was Kapitanleutant Otto Weddigen, who in 1914 helped to inaugurate the modern era of naval warfare by sinking 3 British cruisers by submarine torpedoes in the space of an hour.